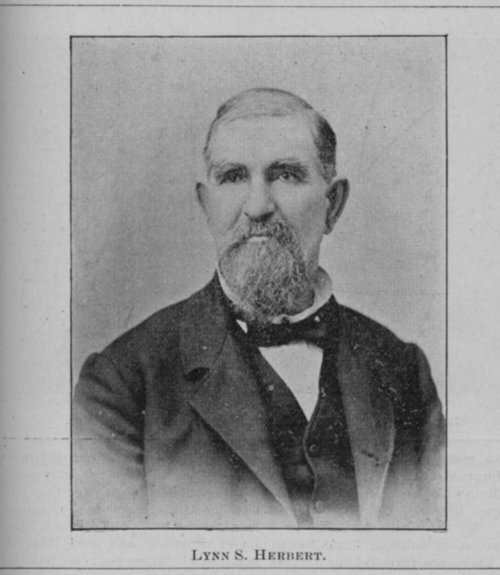 This black and white photograph shows Lynn Seely Herbert,(1822-1903), a teacher from Hiawatha, KS, from the book entitled "Annals of Brown County, Kansas" by Grant W. Harrington. Herbert, a native of Millsboro, Pennsylvania graduated from the Normal School in California, Pennsylvania with a certificate in teaching. Upon graduation he taught in the Pennsylvania communities of Fayette City, Uniontown and Pittsburgh before moving in 1870 to Hiawatha. In this northeastern Kansas town Herbert established a successful teaching career and was appointed in 1872, principal of the Hiawatha school system. Later he served as a school examiner. Actively involved in the community, Herbert held a life long membership in the fraternal organizations of the Masons and Independent Order of Odd Fellows. He also held various appointed offices that included justice of the peace, census taker and police judge. For more than twenty years he was justice of the city of Hiawatha. On December 30, 1903, Herbert's life long dedication to the Hiawatha community came to a close when he died at the age of eighty.